In 1998, Charmed became a hit show about sister witches, and gave stars Alyssa Milano, Shannen Doherty and Holly Marie Combs new iconic roles after their previous stints on Who’s the Boss?, 90210, and Picket Fences. 20 years later, Charmed is back with an all new cast. 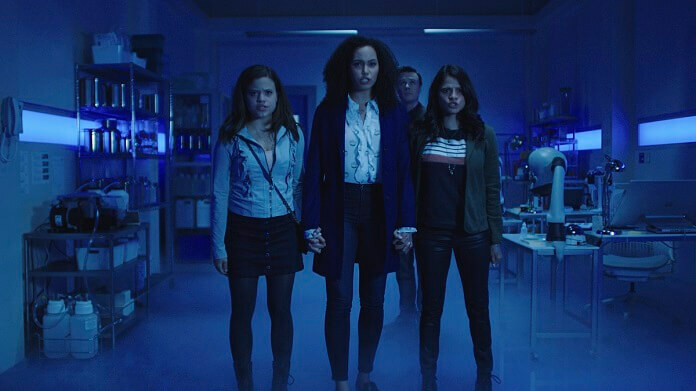 Now Melonie Diaz, Madeleine Mantock, and Sarah Jeffery are the sisters. We spoke with Jeffery after The CW’s Television Critics Association panel for the new Charmed, which premieres Sunday, October 14, 2018 at 9pm ET/PT on The CW. Do you feel any similarities between a witch and the superpowers of The Descendants? How have you coordinated with the visual effects artists to figure out what you’re going to do on set and what they’ll add? Sarah Jeffery: “You know, they’re really great on set in just being informative at that time of what they’re going to do. They already have a plan. My job is basically to just go in there and do what they ask. We do have stunts in this so the whole stunt team is great as well. You also played a pre-existing character in Daphne & Velma. Did you do research for that? Were you more concerned about playing that character than this one? Was Daphne & Velma supposed to continue as a series? So, it would be another movie, not episodic? So a bigger role than the first one? What’s the vibe of sisterhood on the set of Charmed? Are you the Vancouver tour guide? How daunting do you think it would be to have this power in real life? As an actor do you ever feel you have to read your co-stars’ minds? How interesting was Wayward Pines to work on? How young did you start performing? Does the dance help with discipline and commitment? Did you only audition for this role or did you go out for the other sisters too? What scenes did you audition with? Did you do those scenes again with Melanie and Madeleine when they were cast? There’s been both backlash and excitement for Charmed. How have you experienced it?